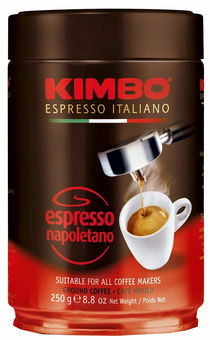 Enjoy Kimbo's Napoletano blend in a gorgeous new tin. Kimbo's freshly ground coffee is perfect for use in cafetieres, filter machines, moka pots and espresso machines. It is vacuum packed to guarantee you the same freshness as the day the beans were roasted. Finely ground and with the exquisite traditional Neapolitan taste famous all around the world!